These sticky honey soy pork chops are an easy dinner. Marinate in the morning, cook up in 20 minutes at night. For as much as I love bacon, it’s a rare day that pork chops make their way into my shopping cart. It’s an even rarer day, when I make them at home and can say I truly enjoyed them. They’re usually just a non-red meat alternative when I’m sick of chicken kinda thing. 9 times out of 10 the chicken wins. Although, at least there aren’t any chances of heads still being attached when dealing with pork. These chops were calling my name though. They were boneless (cutting around the bone = super annoyance. Also, a mess since cutting never works and then I’m left shoving a pork bone into my mouth not so dissimilarly to a dog) thicker than a filet mignon and on sale. The result was something like that mall Chinese food court honey soy chicken taken up a million notches just on pork. 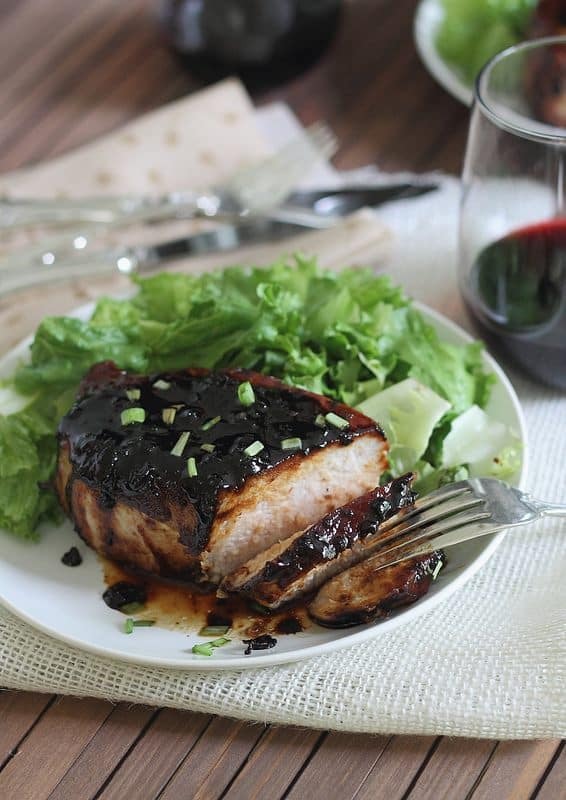 It’s sticky, sweet, gingery with a hint of spice and makes pork anything but boring. This would be that 1 time the pork wins. Like shut-out wins. Pork 10 million, chicken 0. If you love that sticky, sweet and savory glaze, make sure to check out these Chinese boneless spare ribs too – just like takeout and so simple to make at home! Combine all ingredients besides pork in a small bowl and whisk together. 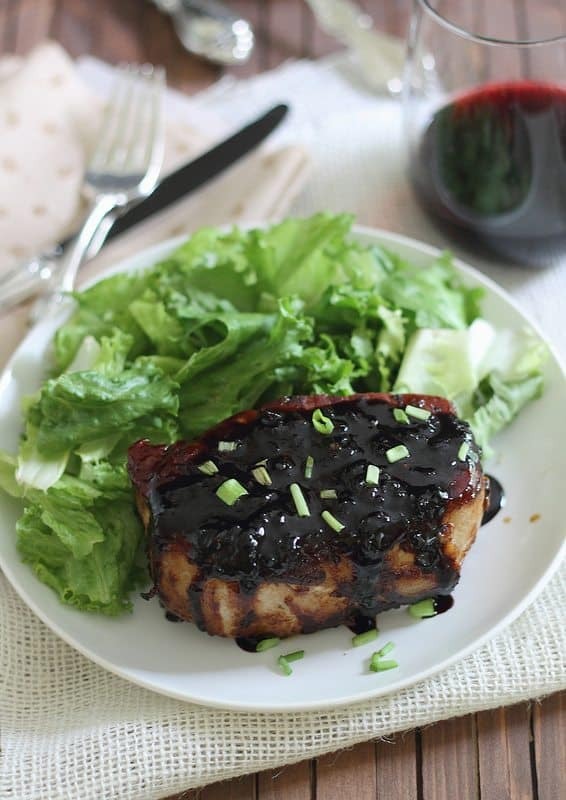 Place pork chops in a sealable plastic bag and pour sauce into the bag. Turn the pork chops over a few times to coat with sauce and seal bag. Refrigerate for 30 minutes up to 4 hours. In a skillet over medium-high heat, brown each side of the pork chops. Pour sauce from the bag over the pork chops in the pan once browned and transfer to the oven in the skillet. Bake for 10-15 minutes until just cooked through (the timing will depend on the thickness of your chops). Remove from oven, plate chops and spoon the thickened sauce over top. I want to swim in that sauce. YUM. YESSSS. I love soy glazed anything. I am 100% making this tonight with chicken (because I’m too lazy to go get pork chops at the store) – think that’ll work? These look delicious- we are the same way with pork, too, we find it difficult to find a cut that we like. But we’ll be on the lookout for some good cuts of pork so we can make this! 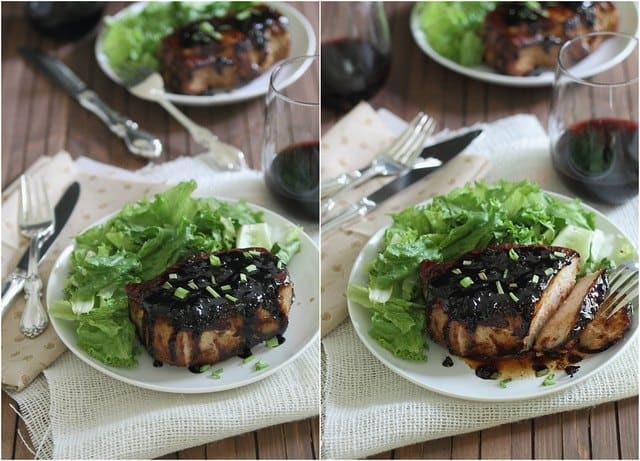 Nice recipe and I really love pork chops – one of my favourites. Thank you.